Summary: 80 Full of laughs and good plot points. Great comedy movies are certainly not in short supply, and the list continues to grow. With “Zoolander 2”having hit theaters on Feb.12, this notion is solidified. The movie stars Ben Stiller, Owen Wilson, and Penelope Cruz, and is studded with other celebrities playing themselves, including Justin Bieber, Kiefer Sutherland, and Ariana Grande, among others. 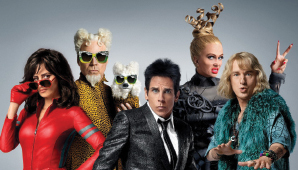 “Zoolander 2” is full of moments that left me rolling with laughter, whether it was from a character’s outfit, the way they talked, or the joke they told, there was never a dull moment. At one time, however, the humor felt forced, but the error was redeemed soon after with another shot of laughter from the audience. The movie is a sequel, yet even being viewed independently, the story can still be understood. The plot follows Derek Zoolander (Ben Stiller) reemerging into the modeling and fashion world, after retreating into exile after the events of the previous movie. After entering the world spotlight again, he and his friend Hansel (Owen Wilson) are pulled into helping special agent Valentina Valencia (Penelope Cruz) put an end to the systematic killing of famous pop stars. Our two main protagonists soon become involved in stopping a plot created by their nemesis from the first film, Mugatu (Will Ferrell), to destroy all of the world’s major fashion icons, including Marc Jacobs, Valentino Garavani, and Tommy Hilfiger. The movie introduces a slew of characters, each one important in furthering the comedic appeal of the film. The inclusion of celebrities also creates a feeling of familiarity, and as if the events in the film were actually happening, because we see these people on the internet everyday. The film also includes tons of comedic action, keeping the audience on the edge of their seat, wondering what crazy event will happen next. There is also an emotional appeal, with Derek struggling to accept his long lost son who, lets just say, didn’t meet his expectations. The soundtrack is also quite lively, from EDM with heavy bass to old-school rock. Overall, the movie is very enjoyable, full of great laughs and plot points. There are great characters played by phenomenal actors, however there is a time when the acting seems forced, as if the vibe from the character is missing, along with a miscellaneous error involving an eyebrow. You’ll catch it when you see it.